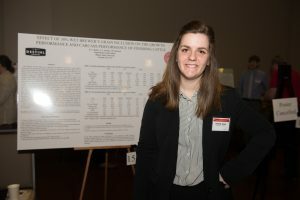 More than 400 undergraduate and graduate students presented at Illinois State's Research Symposium. 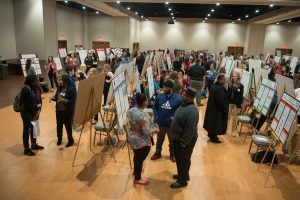 The newly renovated Brown Ballroom in the Bone Student Center played host Friday, April 5, to some of Illinois State’s top minds during the 27th Annual University Research Symposium. 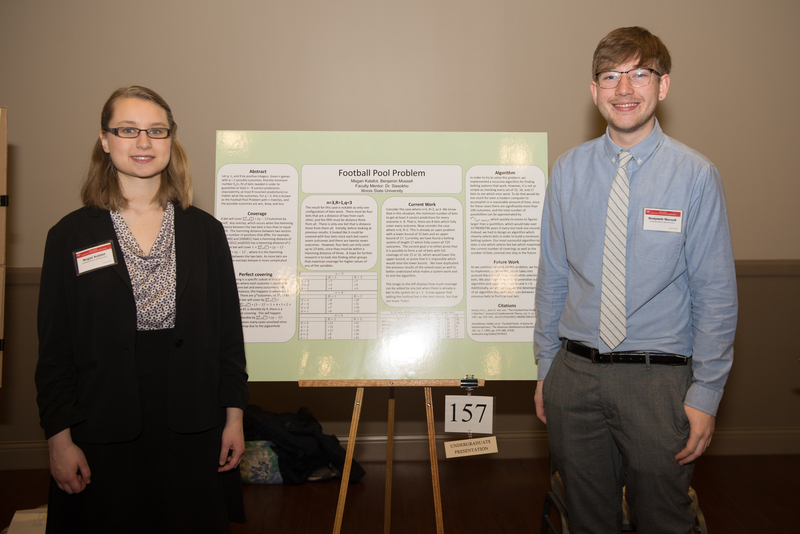 Lines of posters and students filled the Brown Ballroom for the annual Research Symposium. Organized by the Graduate School, the University’s premier showcase for student research, scholarship, and creative expression featured 300 posters presented by more than 400 graduate and undergraduate students representing each of the University’s six colleges. In addition, the anthropology, physics, and theatre programs held oral presentations throughout the day at sites across campus. At the symposium, students stood in front of their research posters and explained to anyone who stopped by what their project entailed, why they did it, and how they arrived at their outcomes. Some of the scholars presented their thesis work; others summarized projects spawned by classroom assignments. The challenge for all the students was to break from the academic jargon endemic to their field and translate their research in a way people who may have had no background in the material could understand. “This is a great opportunity for students to talk about their research to a variety of people,” said Noelle Selkow, interim director of the Graduate School. Selkow said it’s a life skill students will need to use when interviewing for jobs or entrance into graduate school. The symposium also exemplified the special interaction between students and faculty at Illinois State. A professor acted as a mentor on each project, and in many cases, integrated the students’ work into long-running studies. Danielle Belon’s research was a prime example of this. Belon, a master’s student in animal/meat science, conducted the third trial of a multiyear study investigating whether spent beer grain produced by a craft brewery could be used as an economical and dependable supplement to a cow’s regular corn-based diet. Her work built on previous research studies led by her mentor, Agriculture Professor Justin Rickard. Belon found in her study that the beer grain could be a viable feed supplement for farmers if they live within 20 to 100 miles of a craft brewery and can acquire the beer-making by-product cheaply. Mathematicians can find answers for problems consisting of fewer than five games and two predictions. But when the students examined a sample of six games and two predictions, the problem just couldn’t be solved from a practical standpoint. Based on the assumption that each computer calculation would take a second, a solution providing all outcomes wouldn’t be forthcoming for a billion years, the students said. “It gets exponentially complex,” Mussell said. 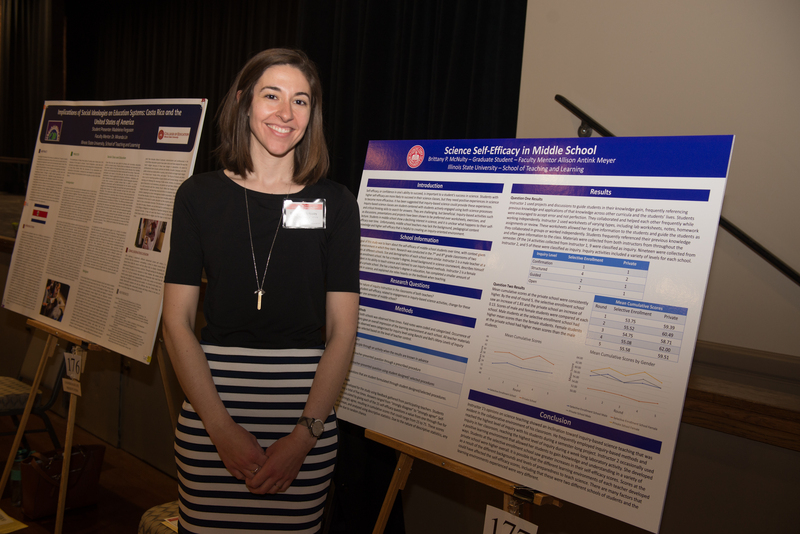 Brittany McNulty, a master’s student in teaching and learning, researched for her thesis whether middle school students’ self-efficacy, or confidence, in science is affected by the teacher’s way of presenting the subject. Specifically, she compared two classrooms, one taught by a teacher with a more traditional, memorization-based methodology, and another classroom led by a teacher who used more research- and inquiry-based methods. McNulty found that the students’ confidence in their scientific abilities did not change in the former class, but did slightly increase under the teacher who used more up-to-date practices. The research is important because many elementary and middle school teachers who do not have a science background may rely on traditional rote practices when teaching the subject. Furthermore, previous studies have shown that students with a higher confidence in science are more likely to take additional science courses in high school and do better in them, McNulty said. 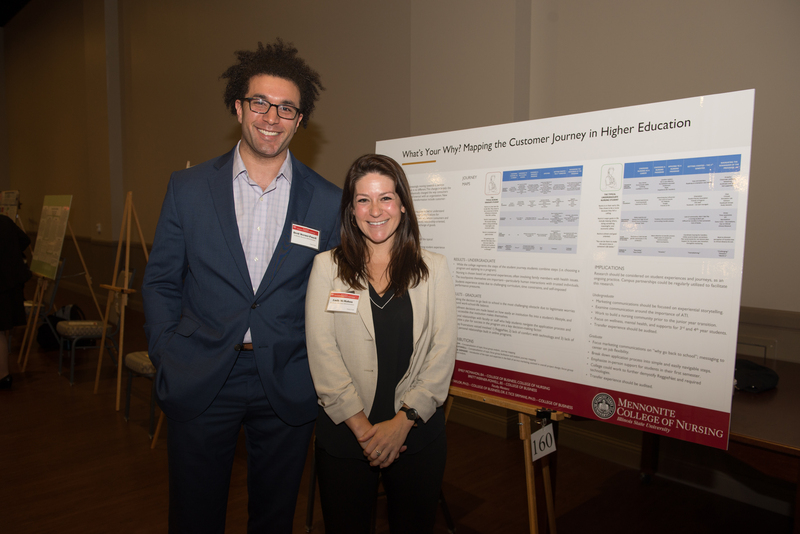 MBA students Emily McMahon and Brett Werner-Powell applied a marketing theory to investigate students’ journeys through the Mennonite College of Nursing (MCN), from the time they apply to graduation. McMahon is MCN’s marketing and recruitment director. Werner-Powell conducted focus groups that enabled the researchers to learn about student experiences without driving the conversation. “This is from their mouths,” McMahon said. By understanding a student’s journey, the college can become a better partner on that journey and better know how to appeal to prospective students. Jessica Xiques and Maggie McReynolds contributed to this story.